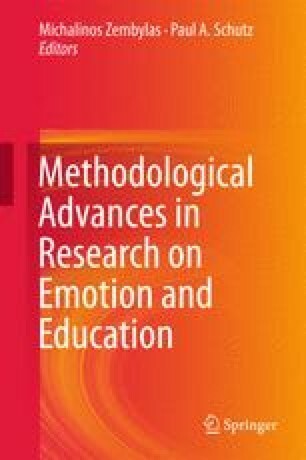 This chapter provides a synthesis of several research methods used by interdisciplinary researchers to investigate emotions in advanced learning technologies. More specifically, the authors: (1) critique self-report measures used to investigate emotions; (2) briefly describe Scherer’s (2009) model as particularly relevant for investigating emotions due to its complex appraisal system; (3) describe three process-oriented methods (electrodermal activity, facial expressions, and eye-tracking) currently used by interdisciplinary researchers to detect, identify, and classify affective states during learning and briefly highlight strengths and weaknesses of each method; and (4) present major conceptual, methodological, and analytical issues related to investigating emotions during learning with advanced learning technologies. The work in this chapter was supported in part by the National Science Foundation, Institute of Education Sciences, Social Sciences and Humanities Research Council of Canada, and Natural Sciences and Engineering Research Council of Canada.